We’re loving seeing the Seven6Main parking lot packed with people enjoying SMOKE, Drip, MadEats and all the new businesses popping up, but we were also very excited to hear that they are already starting on the project of expanding their parking lot. The extension will be on the rear parking and should double the amount of parking for their customers. We’re excited to announce that SMOKE. has finally come to Owasso and is now open for business! SMOKE. Woodfire Grill's cuisine is described as “Inspired American” in genre and “Locally Sourced” in philosophy and ingredients. Their staff works each day to source the highest quality of ingredients including sustainably raised beef, pork, lamb, fish and poultry that is hormone and antibiotic free, all hand cut in house every day. Still, SMOKE’s locally focused ethos does not stop with the food they serve. It extends to the deep list of Oklahoma beers offered, their careful efforts to make certain wines that carry ties to Oklahoma are on their wine list, and even to the local art on the walls. Drip Beverage Lab Announced for the Redbud District! In 2012 Drip The Beverage Lab was born and we have grown year over year ever since. Drip's vision and philosophy starts with the phrase customer first. Every decision they make, from their porcelain coffee mugs to the paint on the walls has always been made with the customer in mind. Treat people the way you wish to be treated. The model has worked and has been a huge success. In 2017 the business expanded into a larger space in Tahlequah and has been wildly popular year after year and we're excited to welcome them to Downtown Owasso! The whole Drip team is passionate about great service, great coffee, and delicious treats. Drip is an independent, family-owned coffee shop coming soon to the Seven6Main development and the Redbud District. MAD Eats Announced for the Redbud District! Chef/Owner Erik Reynolds of SMOKE. Woodfire Grill is bringing a second concept to the Seven6Main mixed-use development in the Redbud District! MAD Eats is an exciting new diner concept focused on offering a family-friendly atmosphere with creative, Chef driven, diner-style food. Expect the unexpected with a modern twist to your favorite diner foods. MAD Eats will feature an all day brunch seven days a week with daily mimosa and bloody Mary specials. Guests can also expect homemade pies and the craziest milkshakes in town! The diner will also feature a variety of local beers, frozen cocktails, and 'boozy shakes' for the grownups to enjoy, plus outside seating with fun games like Corn-hole, giant Jenga, and connect-four. The City of Owasso is making plans to carry out construction on its new Redbud Festival Park. Staff said they expect to break ground on the project in mid-May this year. 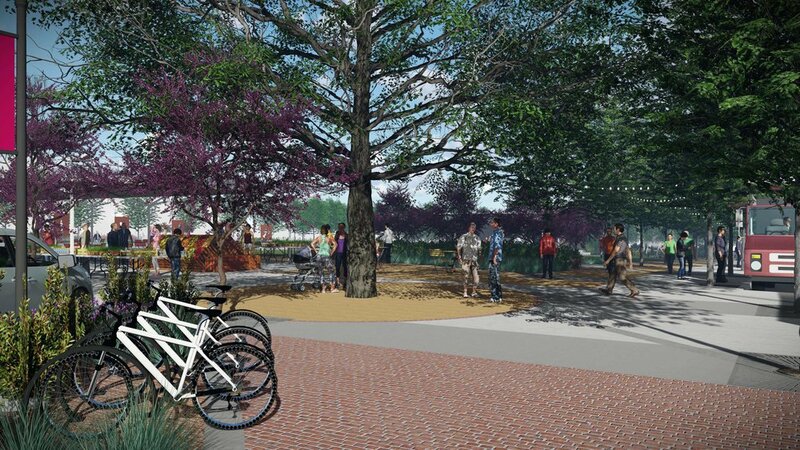 The park, similar to Tulsa’s Guthrie Green, will serve as an open, beautified gathering place in the heart of the newly developed Redbud District. Slotted at 2 acres, the plaza will be built alongside Main Street just south of the police station where the current parking lot is located. Planned amenities will include a large lawn, pavilion, performance stage, updated landscaping such as trees and shrubbery, new parking spaces and more. 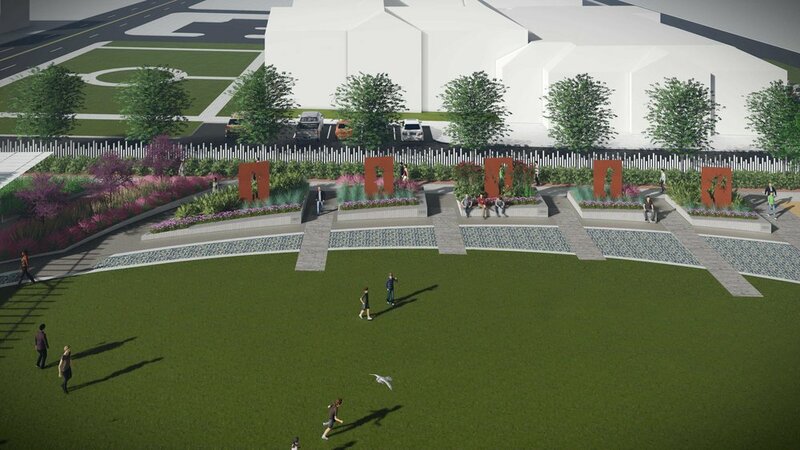 Larry Langford, director of recreation and culture, said the goal in creating the Festival Park is to provide a centralized area where locals can congregate and enjoy events such as concerts and the farmer’s market. Langford said the city is currently out to bid for qualified vendors, budgeted at around $2.5 million through Vision funds, and will present those bids to council for approval in April. The city has set a tentative state date for construction around mid-May, with an estimated completion time in March 2018 before the first Gathering on Main in April. ORIGINAL SOURCE: OWASSO REPORTER. Click to view. Construction on the 41,000 sq. ft. mixed-use commercial and residential building began on Nov 28th at 201 S Main. Owasso. 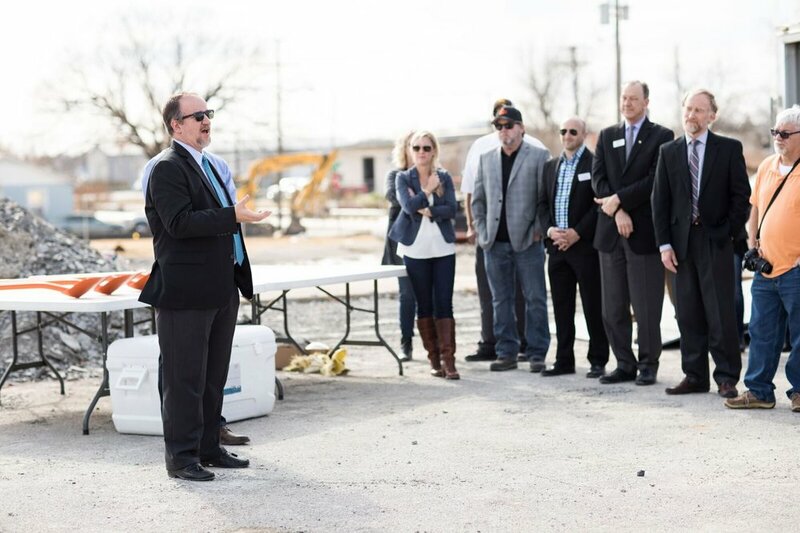 To celebrate, Manhattan Construction hosted a public Groundbreaking Ceremony with representatives from Manhattan Construction, Selser Schaefer Architects, Coulter & Co, First Bank of Owasso, SMOKE. Woodfire Grill and the City of Owasso. 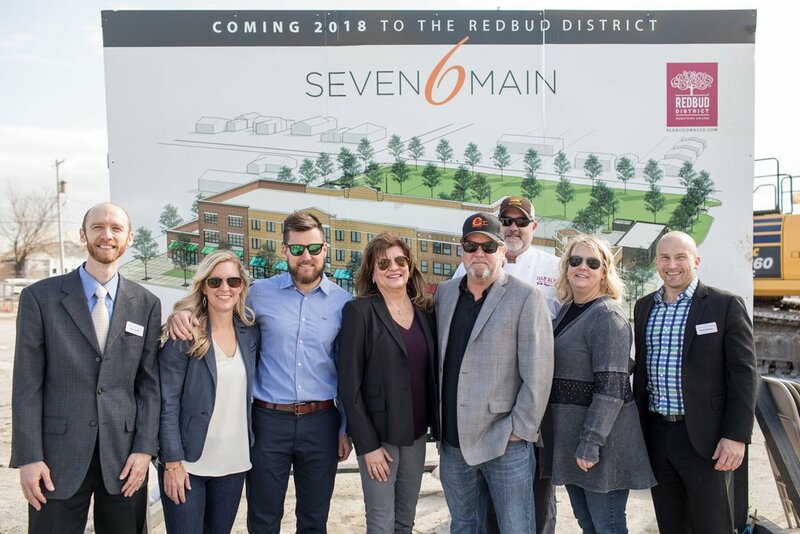 SEVEN6MAIN will help establish a landmark and visible marker for the new Redbud District in downtown Owasso, providing ample area for commercial foot traffic and residential spaces. 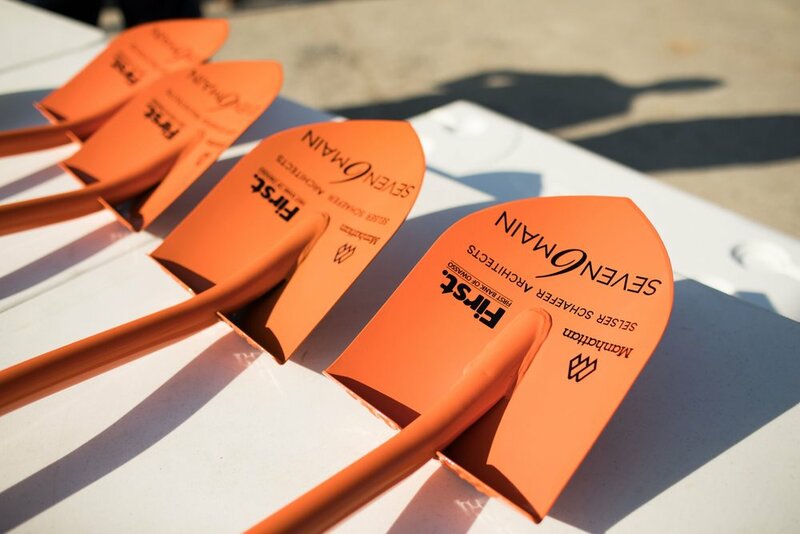 Check out photos from the Groundbreaking Ceremony below!